When I first step into a corral with a wild horse, I try to be very careful that I don't scare him so bad that he might hit the fence and hurt himself. Once I get in the corral I might get pretty close to the center and allow it to circle me in both directions. On the start I don't care too much when they change directions or if they turn towards me or away from me. Soon I will try to encourage it's thoughts to turn toward me on the changes and discourage their thoughts toward turning away from me. I don't think about discouraging their turns away from me but their thoughts to turn away from me. If you wait until they make the turn, it is too late to influence their thoughts. The key lies in the preparation for the turn. No matter which way he turns he must first prepare mentally, then physically for the turn. Before and even during his preparation he can be easily influenced. 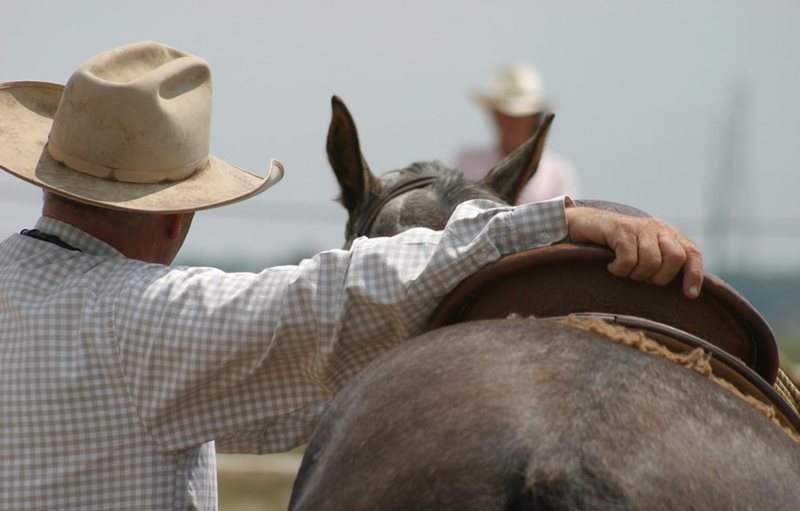 Once the horse begins to execute the actual turn away from you, let him continue because you can't alter it, take a fresh start and get ready sooner on the next time or opportunity. Some may ask, how do you know what his thoughts are? I can only say it takes experience, it is all right there in front of you. It takes learning to see hat you look at and being able to read the subtle signs. You then present yourself in a way and at the opportune time so that the horse can most easily understand what he can do to help you. The reason I want those turns toward me is to build the foundation so he can prepare to learn to follow me. 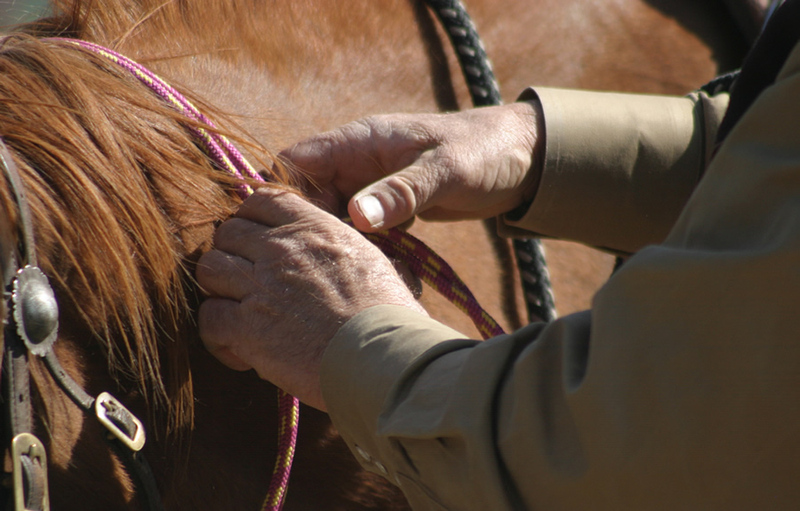 This is important for when I get my rope or halter on him. It takes a good deal of the labor and time out of helping him learn to yield and lead if he has that figured out before hand. These things aren't always easy to learn but they can be fun and rewarding if a person can begin to put them to work. It was the spring of 1975 and I had worked for Ray Hunt twice before. Both times it had been fun and valuable with lots of good horse projects with which to work. When I came back for this time, it started out not so fun. One horse in particular was a big, strong, ranch raised gelding about five years old that I had lots of trouble getting him to go. He'd hang up and then when he would go, he'd kick at my feet and either stampede or buck. He was miserable and I was miserable. This went on into the second week. Instead of getting better, it was getting worse. This horse had never bucked me off but was getting closer all the time. On several occasions I would mention my dilemma to Ray, and he would just smile and say, "Trust me, you'll be thanking God for this horse." But I wasn't thanking God and I was not having any fun. It was very stressful. I can remember this would be the first horse Ray would have me catch every morning. The only good part of that was knowing that when I stepped off I didn't have to get back on him for another 23 hours. That was quite a few years before I had become a Christian and I prayed about nothing. However, during that time I made the exception. I was praying for anything that would have gotten me out of this situation. One time during the second week when I asked him to accelerate he bucked with me pretty hard. I felt as though I was riding him by the skin of my teeth. The arena was made of big, heavy planks. He was bucking straight for the fence when he plowed his head into those big, heavy planks going full speed ahead. This brought things to a very abrupt halt. He blew me about half way up his neck and he was pretty well stunned. My heart was racing and I had a nauseous, shaky feeling like I've had when I just missed getting in a car wreck. I looked up at Ray but he as at the other end of the arena with his back to me. He didn't seem to have noticed my ride. I decided to go down and have a little conference with him. I asked "Did you see this horse?" He said he didn't and as I began to tell the details he looked down and started to laugh. He said that the horse had blood dripping out of both nostrils. I wasn't laughing much and told Ray that I didn't think I was doing his horse much good. He could tell by my face that I was really not having much fun. Ray said, "Well maybe now you are ready for some help." I was thinking that last week would have been fine, but I sure didn't argue with him. When I asked him to go he would try to kick at the spur on my boot. Ray said, "Before he kicks at your boot, ask him on one side, but change to the other side. Bump him with your stirrup, and then with your other spur. Before he kicks at it, change the focus." Pretty soon that horse just leaned forward like he was going to leave. I wanted to keep the motion but Ray said, "No, no, no, just let him die back down to a standstill then it will give you another chance to start again." "Just get him going, don't try and keep him going." In a matter of minutes I could feel that horse let down, start to relax and learn to go. His ears were getting up for the first time, his tail wasn't like a propeller and he wasn't trying to kick at my feet. Five minutes made a big difference. In the next few rides I built on this and was able to stand around, then ask him to go right into a walk, trot or lope. He was so much happier, and yes, so was I. I was thanking God for that horse. What I learned on that horse I use on every horse I ride. I use it in everything I do whether it's getting a horse to load, breaking a colt to lead, whatever. It's the little things that make the big difference. How many times had I heard Ray explain the importance of settling for the slightest try. I thought I had been doing that but I was not recognizing and rewarding his smallest efforts. Since this time I have started many difficult horses that could not have had the same problem but had no problem in getting them going and had fun with the challenge. I look back and think of how I suffered and prayed that God would remove this curse from my life. However, I can't help but think that if God had answered my prayer I would have missed the blessing He had planned for me. It wasn't fun, but it was so valuable. I suppose Ray let me sweat it out for a time in an effort to make a lasting impression upon me and I would say he did a good job. Occasionally, someone asks my opinion on giving handouts to horses. I've had some people say it can cause horses to become pushy and obnoxious. I suppose that would be right with some people. I suppose some people that give their child a cookie once in awhile might have them screaming and crying for one all the time. If they gave in to that behavior they could have a pushy and obnoxious child on their hands. The last few days have been stormy at our place. The corrals are real muddy. Catching a horse in the lot where I keep them can be not fun at all. They might decide they need a day off and not want to be caught. I have a small trough by the gate and I throw part of a hand full of grain in there to be shared by seven head of horses. They are on to the routine. I started this when the corral was dry. It sure is nice to have them meet me at the gate instead of me wading through that mud. I've never had one get pushy, but if he did he might get a poke in the nose instead of a treat. It doesn't take a bucket of grain for this. I remember Tom Dorrance joking, "If each horse gets two kernels of grain they got one too many." I also have two yearling colts that arrived a couple days ago. They were range raised and pretty leery of me. Yesterday they found out what grain tastes like. I offered it to them in the lid of a plastic barrel. It was perfect, they didn't have to get too close to me or run their head down a bucket. Today I will make an offer every time I change horses and perhaps before the day is over they will take some from my hand. They were broke to lead and handled some last fall, but now they don't know if they can quite trust me yet. The grain will help them appreciate my presence and help bridge the gap between us. One was a little bolder. They shyer one was using his partner for security as he came up for his treat. Grain or whatever treat you like can be just the tool you need if you use it appropriately and at the right time. These colts won't get pushy. As soon as they get friendly and glad to see me I'll turn them back out in the pasture and get two more to work on. They won't forget this and will be glad to see me in the future when they get another opportunity. While feeding hay in a manger where I keep my saddle horses, one customer's horse stepped in front of me. I needed to step around him to deliver my hay. He was too gentle to spook off and it was safer to step around him. The next time I feed out there I may have a buggy whip tucked under my arm load of hay. I don't need to murder him. However, before he becomes crabby about being fed, I need to help him realize the difference between appropriate and inappropriate behavior. Horses can become friendly and glad to see you, however they need to learn there is a line out there that they would be better off not crossing. Years ago a friend, who was running a cowboy crew, told me about a horse he had that would whirl away when he turned him loose. The horse had been doing this for years and had a strong pattern established. 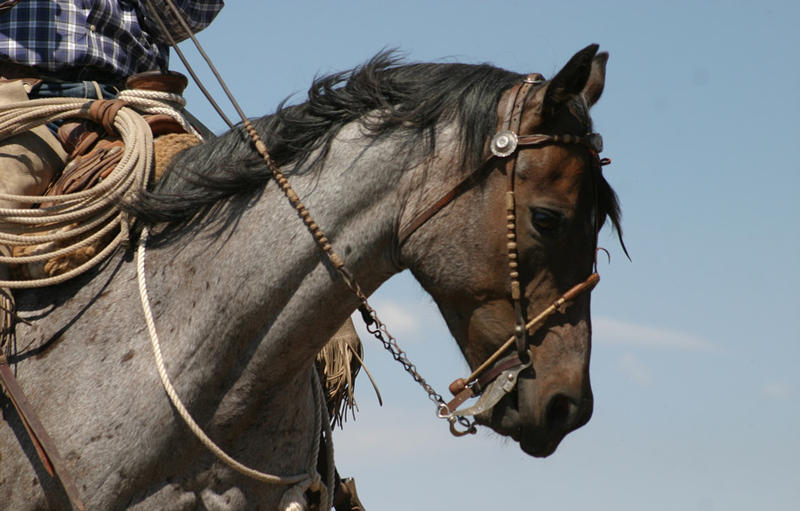 Tom Dorrance, another friend, had come to the ranch where this horse lived. Tom had the answer to my friend's predicament and it was so easy it was ridiculous. 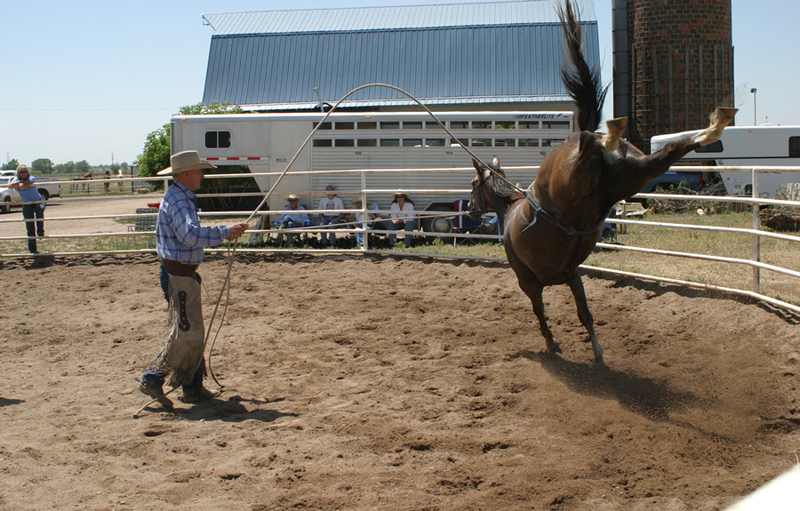 Tom had the fellow get the halter ready to come off and had him allow it to drop off the horse's head while he walked off holding the lead rope. Instead of letting the horse leave you — you leave the horse. He left the horse standing in his own tracks wondering where the cowboy was going. I've had many horses similar to this one, but in milder form. Since my friend told me this story of how Tom helped him, I have been leaving the horse and not letting the horse leave me. it is pretty nice to turn them loose and have them follow you back to the gate. It is like they are saying "Are we done here?" instead of "Adios, I'm out of here!" This story reminds me of when I was in grade school. In some of my classes, when the bell rang, the kids would jump out of their desks and hit the door. The teacher had better talk fast if she had any last minute instructions. Other teachers wouldn't have it that way. Some would make sure you sat in your seat and listened to last minute instructions and were dismissed when they said you could go. It was a lesson in discipline for everybody and a much more orderly way to conduct a class. Whether it is kids or horses, it's the little things that can make such a big difference.